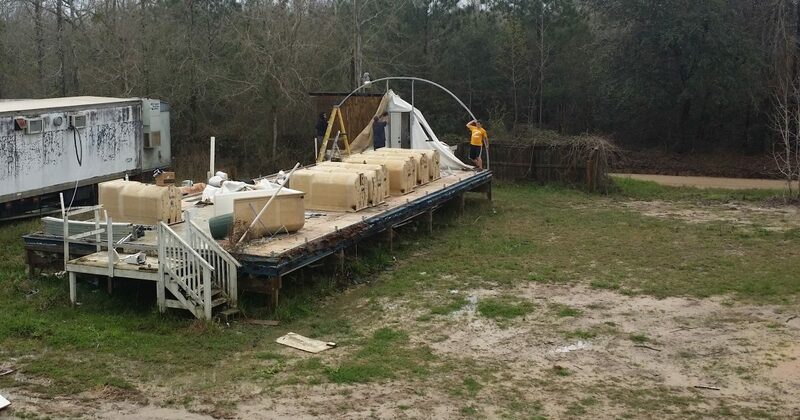 At the height of our Katrina relief, recovery, and rebuilding efforts we had 6 Quonset huts on the church property. Last week, the final structure came down. We praise God for our long term partners from Cross & Resurrection Church, Ypsilanti, Michigan who worked hard in spite of equipment break-downs, busted water pipes, and other things. It was a great week and we saw wonderful progress. The complete clean-up continues. We need to finish dismantling the quonset hut platform, move some sheds, take up temporary walkways, dispose of left over random building materials, and several other things. The job is not over. We could sure use a few groups this summer who would be willing to come and get dirty and help bring our long term vision for the bunk house property into sharper focus for the glory of God. Contact us today to plan your mission trip for this summer.